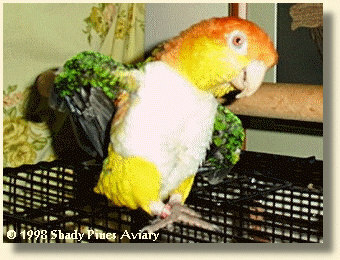 Ollie came to us as a two year old, originally purchased as a future breeder. He quickly became one of the family. Although he has his moody moments, he is basically a good natured, loving bird who enjoys being touched and tickled all over. 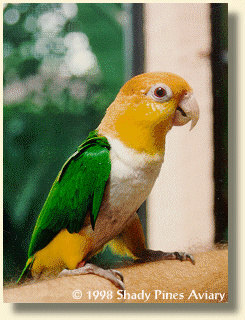 Special also came to us as a two year old, the pet of a gal who dabbled with breeding Caiques before realizing just how much work was really involved. Although I discourage housing two males together, Special became cagemate and companion to Ollie. Although they sometimes squabble, they quickly make up and are best friends. Special is a friendly fellow and will go to most people, although he is a bit "beaky" and can get rough. 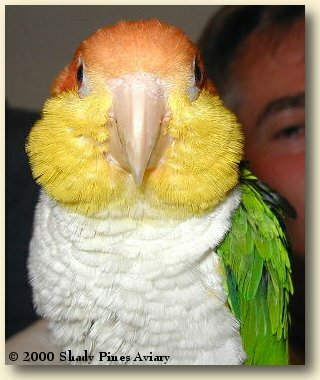 He has the puffiest cheeks I have ever seen on any Caique.